The San Francisco Rapid Response Network hotline, (415) 200-1548, supports people faced with imminent deportation or immigration issues, and is part of a wave of regional support for immigrants living in the Bay Area. You can get a full list of rapid-response hotlines for the greater Bay Area and adjacent regions at the end of this article. This story originally aired in March of 2017, and has been updated online. 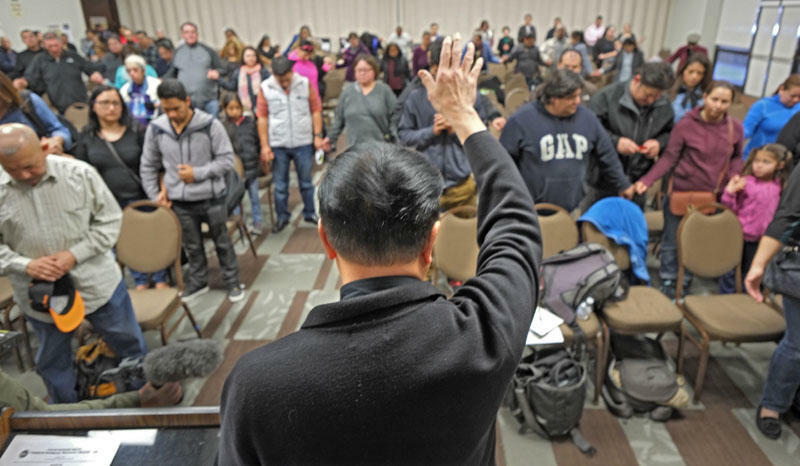 All over the Bay Area, faith groups are stepping up to oppose the Trump administration’s executive orders that could clear the way for massive deportations. Some are joining a growing network of sanctuary churches where those at risk of deportation could stay indefinitely. Others are offering support like food or references to legal aid. In San Francisco, the Catholic Archdiocese is also pushing hard to address the needs. Two parishes say they will offer sanctuary. Every week “Know Your Rights” meetings are hosted on church grounds. In addition, there’s another effort afoot: a hotline for people to call should immigration officers show up in their neighborhoods, home or work. The hotline is a collaboration between nonprofits and the San Francisco Archdiocese. It’s funded by the city of San Francisco. She was thinking of something like 911, that you could use if ICE, the Immigrations and Customs Enforcement arm of Homeland Security, showed up at your door. Violeta Roman stands in front of a poster of the hotline. 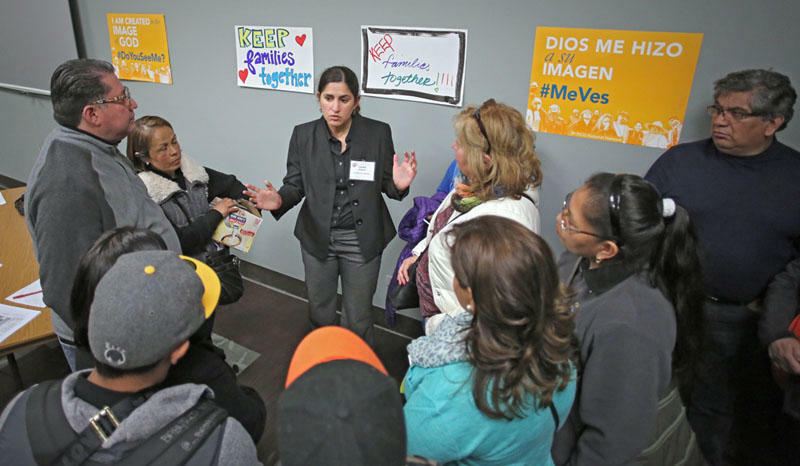 Lorena Melgarejo works for the San Francisco Catholic Archdiocese, coordinating help for the immigrant community. She was Roman’s companion in the car that day. 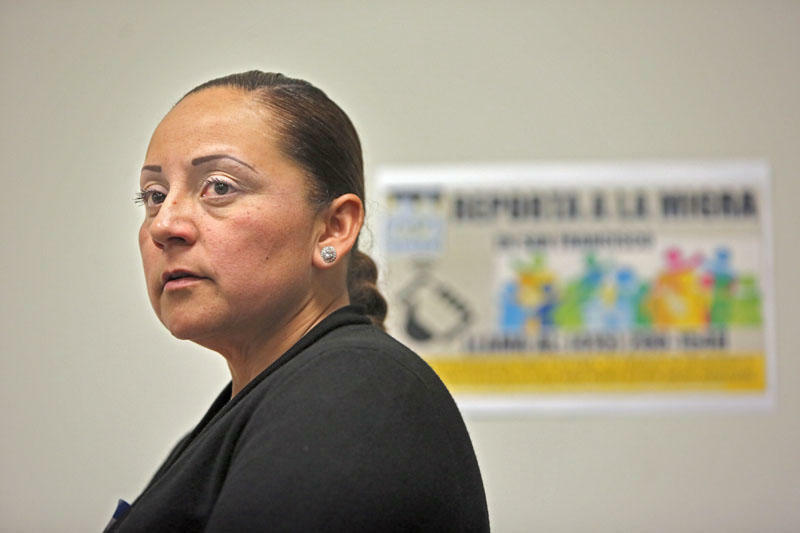 Violeta Roman’s vision for a hotline was guided by personal experience. Two and a half years ago, at five in the morning, ICE agents came to her house for her father, who was undocumented. Roman was at work. “My daughter said they were knocking really hard on the door and said they were police. They never said that they were immigration,” Roman says. Frightened, her daughter opened the door. The officers handcuffed and took away Roman’s father. “And when this happened to my father, the first place I ran was my church,” Roman says. Her priest introduced her to Melgarejo, who helped find a lawyer. Church members went to court with her father. They listened to her. Her father eventually gave up fighting his case and returned to Mexico. Even so, Roman feels lucky. 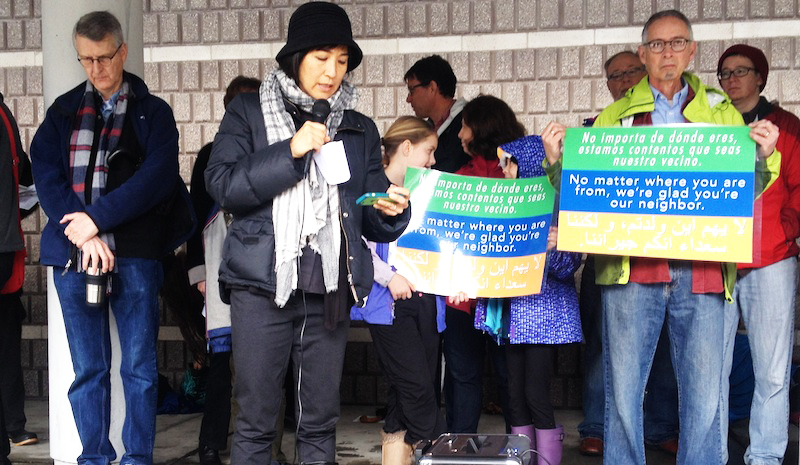 She knows not everyone has access to that kind of help — which is where the hotline idea came in. It turns out Melgarejo, who was there in the car, was just the person who could help make a hotline happen. She’s well-connected to other immigrant advocates. In addition to her job at the Archdiocese, she works for nonprofit Faith in Action as a community organizer. “This reality of regular, everyday people being targeted by immigration is not something that just started after the elections,” she says. Still, she says it’s a different era. After Trump’s election and executive orders, the threat is higher in San Francisco. A collaboration of nonprofits called the Immigration Legal and Education Network had already begun putting together a hotline. It connected undocumented people who had been arrested by ICE with legal help. Roman and Melgarejo decided to team up with them. The nonprofits had lawyers and city government funds to pay for the hotline. The Archdiocese and its partners could help spread the word. They also began recruiting volunteers who would provide support for families, and witnesses who would physically be there as ICE made its arrests. Melgarejo says she knows this fear from the inside. Her own family lived for years in the U.S. without papers. They came from Paraguay on a temporary visa in 1993. On a rainy weekday evening, about 60 people are gathered in the vast cathedral of Saint Agnes Church in San Francisco’s Haight Ashbury neighborhood. They’re here for a volunteer training. Some are church members, others not, but all are inspired to help a community that’s become more vulnerable under the Trump administration. From a podium, Melgarejo asks how many people know someone who was deported in the past eight years. 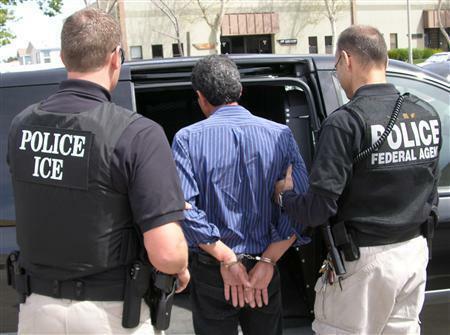 In San Francisco, Homeland Security reported more than 31,000 enforcement and removal operations in 2011. Only a few hands go up. This is the moment to forge community connections, she says. Then she tells them about the hotline and how the volunteer part will work. After someone calls, volunteers will go to where that person is — their home or place of work. First, they’ll verify that it’s not a false alarm. If they arrive after an arrest, they’ll connect with the detainee’s family. If ICE is still there, they’ll turn into observers and videotape. They won’t interfere with what’s happening, but the videotapes can be used as evidence in immigration court, if necessary. At the time, she says she didn’t understand the full impact. Being part of a solution is also the intent of Saint Agnes, the church where tonight’s training takes place. Its congregation has few, if any undocumented members. Even so, it has decided to stand up to mass deportations. This is its second volunteer training — the first attracted more than 350 people. It’s also declared itself a sanctuary church, willing to shelter people with final deportation orders. Natalie Terry, director of Saint Agnes’ Spiritual Life Center, is heading up the effort. She says she thinks the Catholic Church hasn’t always done the right thing. She says Christian teachings are guiding her church’s actions now to help the undocumented community. Members of the Catholic Church played a big role in bringing attention to the brutal Central American civil wars of the 1980s, and the U.S. role in them. But the Church was far from united in its criticism of government policies. Not all priests supported the civil disobedience at the heart of the sanctuary movement, which sheltered refugees without papers on the safety of church grounds. 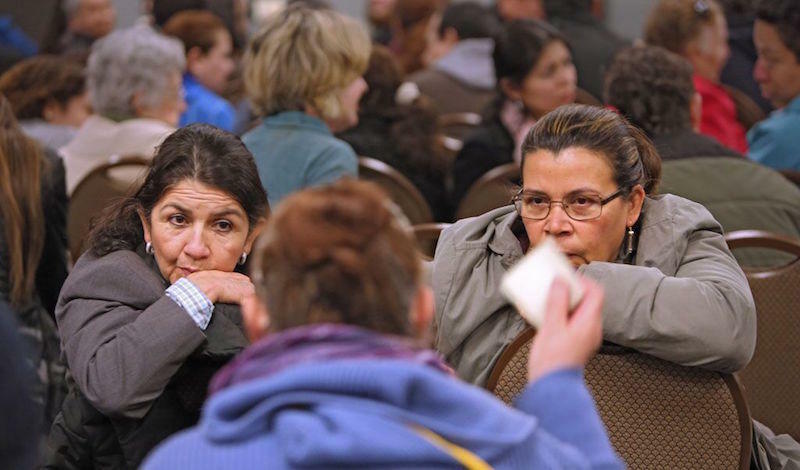 The California Catholic Conference of Bishops released a strong statement against policies that target undocumented immigrants at the end of February. But individual bishops are divided on how much action to take. In San Francisco, Archbishop Salvatore Cordileone is taking a proactive stance. That includes supporting churches that want to be sanctuary spaces, and those providing other types of support, like the hotline idea. Sunday Mass is ending at the Cathedral of Saint Mary of the Assumption, high on a hill in San Francisco’s Western Addition. 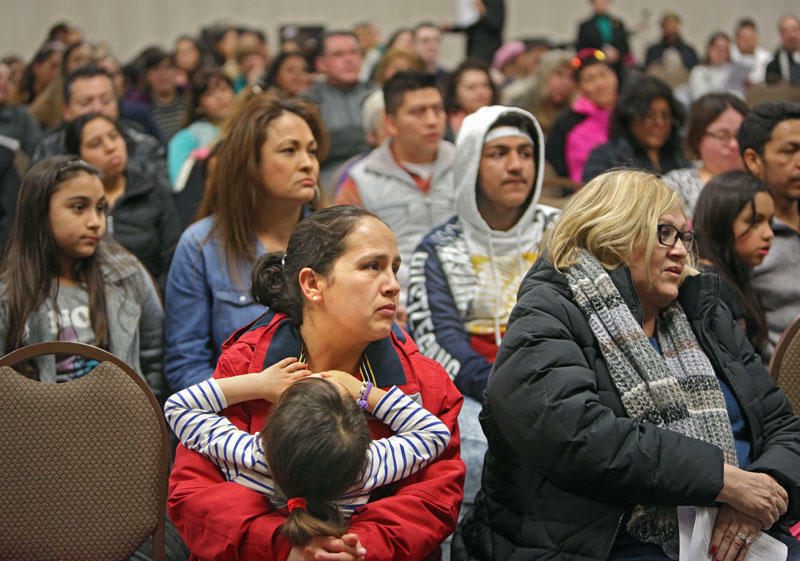 But today, many of the Latino congregants will not go home. Instead they’re heading downstairs for a workshop to learn about their constitutional rights. A mother and child sat with dozens of attendees in the St. Mary’s meeting room. More than 200 people have crowded into the space, which is standing-room-only in the back. The church’s priest, Father Arturo Albano, begins to speak. “Good afternoon,” he says in Spanish. The audience laughs and claps when he says that he is of Filipino blood, but with a Latino heart. They laugh again when he says that his dog, whom he holds by a leash in his hand, is from Juarez, Mexico and is undocumented. “President Trump wants to arrest him,” he says. Attorney Mark Silverman takes the pulse of the audience. He’s with the nonprofit Immigrant Legal Resource Center, one of the groups that is providing legal support to the San Francisco hotline. He asks people to raise their hands if they have no fear about immigration. Only a few hands go up. He asks if anyone feels panic. Far more people raise their hands. Then he says something reassuring. He tells the group that for the majority of undocumented people, the risk of being deported is small. They still need to be informed, he says, and they need to know their rights, such as the right to stay silent if asked for papers, or where they were born. He also says that if detained, they should fight in court. They may not win the case, but it will buy time and by then, there could be a new administration. During the presentations, an older man in the front row stands up. He asks in Spanish if there is someone connected to the Mexican consulate who can speak for him, if he is detained. Lorena Melgarejo points to a poster that advertises the hotline for the San Francisco Rapid Response Network. If ICE comes, you can call this number and there will be help, she says. The older man’s name is Francisco, he didn’t want us to use his last name because of fears about his immigration status. He’s originally from Mexico, but has lived in the United States for 17 years. He says he arrived to the meeting worried, but feels a lot better now. But after the meeting, he says he feels different. In a place like this, he’s among friends. The meet at St. Mary’s ends with a blessing. That’s also what Violeta Roman felt when she received support after her father was detained. Now her dream of the hotline promises to help others feel less alone. Lorena Melgarejo says it’s appropriate and important for the church to take an active role. In her mind, this is a spiritual crisis. San Francisco is the first county in the Bay Area to organize a hotline like this, but Melgarejo says it won’t be the last. Already Alameda has launched a similar program. And she’s working to help San Mateo, Marin and San Jose do the same. In the 1980s, hundreds of congregations across the country declared themselves to be sanctuaries, safe havens for refugees fleeing civil war in Central America. Today, there’s a revival underway of that original refugee sanctuary movement, in which churches make themselves sanctuary spaces. Host Ethan Elkind and guests discuss the new landscape of immigration under the Trump administration.